For once, the world is in agreement: travel makes us happier and more creative. * But how many of us can truly say we get joy from days spent scouring the internet for flight deals and choosing accommodation? According to the latest research commissioned by Flight Centre, this demanding DIY booking process has led to a serious boom in planning anxiety among couples. A OnePoll study, conducted for Flight Centre, of 2,000 people in relationships, reveals that over a third of people experience travel anxiety, brought on by the stresses and intricacies of booking a holiday with their partner. From the pressure of deciding a holiday budget and catching good deals to reading Trip Advisor reviews and then forgetting to book extras, the tasks soon stack up and can seem overwhelming. In fact, 58.7% of people surveyed said the hurdles involved in booking their escape had caused friction and stress in their lives. With the stress of planning causing so much anxiety, 45 per cent of people in relationships admitted that they would rather have a third party organise their holiday for them to avoid these holiday-booking barnies, or even the dreaded break-up. However, only 4.5 per cent of couples currently search for help to alleviate this stress and make travel a joyful experience. That’s why this year, Flight Centre is recommending that couples wanting to put the joy back into their holiday should Marie Kondo their travel plans for a more streamlined process. Bringing on board a trusted Travel Expert will throw out the stresses of online booking and arrange a perfectly planned holiday to suit each couple. Lucy Clifton, Flight Centre Head of Operations, said: “Travel is one of life’s most positive experiences and the organisation of your upcoming trip should be as exciting as the journey itself. With the help of our expert consultants we want to help declutter the booking process – not to mention your browser! We can put the joy back into every stage of travel by removing the stress and worry of planning a dream holiday”. When it comes to couples’ arguments, deciding on when to travel and fly (24.1 per cent), budget (17.7 per cent) and destinations (15.8 per cent) proved to be the biggest causes of friction when couples book holidays together. And it’s no wonder our anxiety levels are through the roof while planning our holidays, with couples spending an average 105 minutes arguing per holiday booking session. 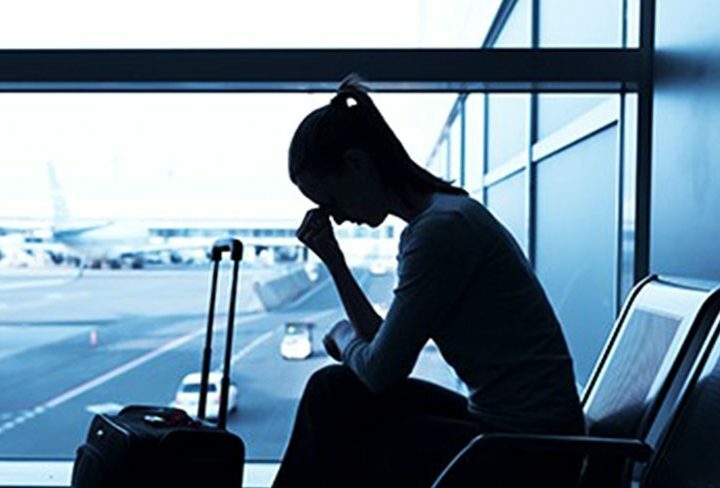 While the trend for shorter breaks may have been attributed in the past to hectic lifestyles, Flight Centre research claims that it could be down to a rise in travel anxiety. Almost one fifth (19 per cent) of couples say they are forced to book shorter breaks, as their current booking process inflicts too much stress, effort and time on their relationship. In fact, couples are forced to put their entire relationship on the line in order to navigate the quagmire of holiday booking, with 14% of couples having broken-up due to arguments while arranging a break – it’s no wonder that anxiety runs high! “Flight Centre’s expert travel agents are the perfect solution to alleviate tension and put the fun back into booking,” Lucy Clifton said. “Couples can choose to speak to their agent individually or together and their dedicated agent will take the time to ensure you get a trip suited to both your desires. “Our customers build genuine, lasting relationships with our consultants, as evidenced by our Trustpilot score of 9.7 out of 10. This is driven by 18,000 five star reviews and customers often make the point of praising our consultants by name”. The Flight Centre Travel Group (fctgl.com) is one of the world’s largest travel companies with over 18,000 staff and 2500 stores across its leisure, corporate and wholesale businesses. The company’s turnover in 2014/2015 financial year was £9 billion. After starting with one shop 30 years ago, FCTG has enjoyed remarkable growth and is one of the top 100 publicly listed companies on the Australian Securities Exchange. All specialist brands under the FCTG Corporate banner offer 24/7 support and the benefits of a blended offline/online solution; global negotiation strength and unique and superior business travel products. The team at Flight Centre are experts when it comes to travel and are committed to providing customers with a great experience. The company’s success comes down to its people, experienced Travel Experts who are passionate about finding their customers the holiday they want, for the price they want. Since establishing the first Flight Centre store in 1995, the business has grown its team of Travel Experts to include over 80 stores within the United Kingdom, with new stores opening regularly. Worldwide, Flight Centre has an amazing 2,500 stores across the United Kingdom, Australia, New Zealand, South Africa, United States, Canada and more, making Flight Centre one of the largest and most successful independent travel retailers in the world. With its global reach and close relationships with the world’s best travel providers, the company is able to provide competitive travel deals. The Flight Centre team can organise anything from flights and hotels, car hire, tours, travel insurance, visas and more to tailor make the perfect holiday. They also have dedicated First and Business Class flight teams and Business Travel teams to help with any specialised travel needs. For more information go to www.flightcentre.co.uk, www.facebook.com/FlightCentreUK, www.twitter.com/flightcentre_UK or www.instagram.com/flightcentreuk. We Were (Supposed to be Going) on a Break!